Size: 681 sq.ft. - 1821 sq.ft. 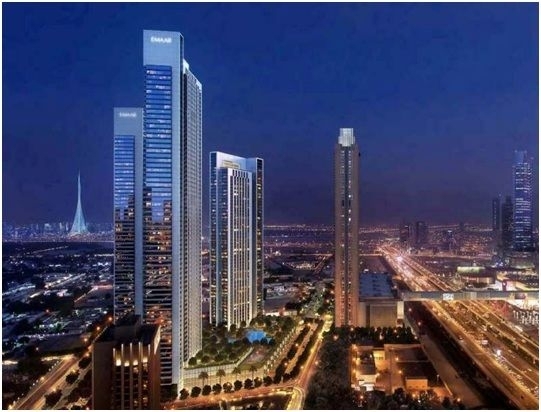 The Views II is a new residential apartment tower in Dubai Downtown evolved by the well-known developer of Dubai – Emaar Properties.Downtown Views II is a Residential Tower located above the 9 storey podium of the Dubai Mall extension. It comprises of one to three bedrooms and there is also a collection of duplex apartments on the upper levels of the tower. This new residential stage will also be defined by high quality finishes and superior amenities.Views II project was announced in January 2017 and its completion scheduled by December 2020. The Views II tower is expected to have 55 high rise luxurious residential apartments. Downtown Views II is chosen to become a reference for the best in architecture and comfort/delight living in Dubai. The podium level of residential allows its residents to enjoy benefits ofa pool, health club terrace, a grand entrance lobby at the lower level and more than 400 basement car parking spaces available.Downtown Views II will consist of a total of 418 apartments approximately. Eachapartment is enveloped withhigh-end interiors and finishes that will set Views IIapart. From the rich deep colours of marble to the fine precision of steel in Views II only the highest standard of fixtures and fittings will be featured in the all residential units. It is meticulously structured by a leading design team where each element will lend itself perfectly that suits everybody lifestyle. Emaar Properties in its primary market of Dubai including established communities and on-going developments in various stages of completion. Emaar Properties has extended its expertise, developing competencies in hospitality, leisure and retail since its establishment in 1997. The developer is also known for its high quality residences and office spaces located in its key master developments. Downtown Views II Tower Apartment is just a moment away from shopping, restaurants and entertainment. It is just like the pinnacle of urban living in Dubai location. Downtown Views II will be setting a new standard of living.Residents can take full advantage of 360 degree unobstructed view of the Dubai landscape. Views II is placed at the direct connection to The Dubai Mall atDowntown,BurjKhalifa and The Opera District just beyond the dancing Dubai Fountain, DIFC, Sheikh Zayed Road and the city’s financial and commercial heart. Downtown Views II tower by Emaar is taking place at Downtown Dubai near Dubai Mall, United Arab Emirates. The View II plan is equipped with a delightful, luxurious and day to day facilities including Swimming complex, Fitness centre, Athletics spa, Gourmet concept dining destination, Public festivals and open air performances, Reel cinemas - movie experience, skate parks, Zabeel view Poolside BBQ area and temperature-controlled outdoor pool, kids playground, multi-sport court and kids’ pool.